Check out this excellent airmail wallet from Dynomighty Design, suggestive of friends and business contacts in far-flung places and supersonic jet age cool. 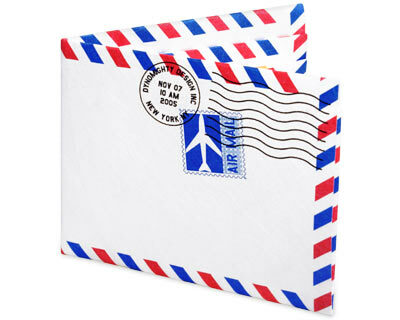 I have never sent an airmail letter, but this could help me pretend that I’m the kind of person who does. I’m uncertain, though, about carrying a white wallet – won’t it get smudged? Then again, it’s not like my pockets are full of engine grease and tar. Via Boing Boing, where Cory prefers the dot matrix paper-style wallet. My abject apologies to the French for massacring their language.